Dean: Garth has a safe-houseboat? Sam: Dude, I don't even ask questions anymore. First appearing in episode 8.10 Torn and Frayed, Fizzles' Folly is a boat owned by Garth. 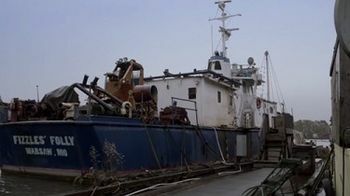 The boat is docked in Warsaw, Missouri, and throughout season eight it served as a demon-proof safe house for Kevin Tran while he attempted to decipher the demon tablet for the trials to seal the Gates of Hell. Dean, in an attempt to protect Kevin, warded the boat against demons but not angels, in the hope of Castiel finding his way there. However Crowley was able to circumvent the wards and abduct Kevin. Fizzles' Folly has not been seen since, though Crowley kept Kevin in an illusion of the boat to trick him into translating his half of the demon tablet, but Kevin sees past his tricks and gets rescued by Metatron. This page was last edited on 16 March 2019, at 09:36.